Mark - Oriental house in the clouds, in black, above green oval with white Chinese letters (? ), above the words "Made In China," in black. All the pieces I have. This one didn't come out as well as the others! The set is six cups and six saucers. I don't know if that is all the set contained originally, but that is what I have sitting in front of me. 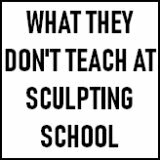 They are small, meant for a child. 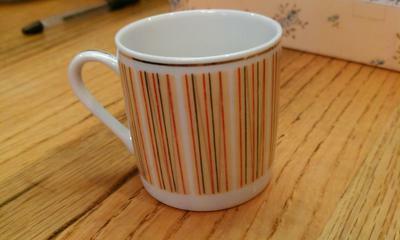 The cups have vertical stripes of orange, burnt orange, brown and light orange with occasional off kilter beige lines. These vertical sets of lines are in even groups around the cup. The rim of the cup has a gold line on the horizontal. The handle is delicate, white and has a partial gold line running from the cup down the handle, but not all the way to the bottom of the handle. The cups measure 2 1/8" tall by 2 1/8" around. 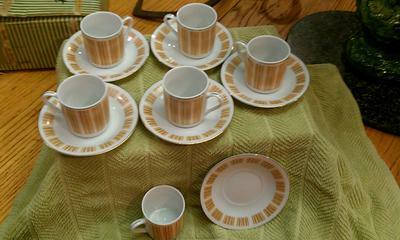 The saucers have the same color scheme but The sections of stripes are not as long as the cups markings. These sections of lines are on the outer edge of the saucer. 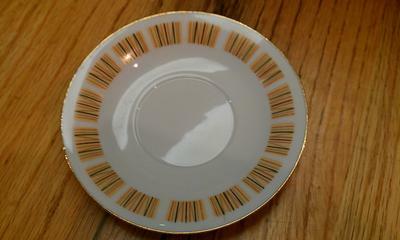 There is also the same gold line around the outer rim of the saucer. These saucers measure 4 5/8" around. 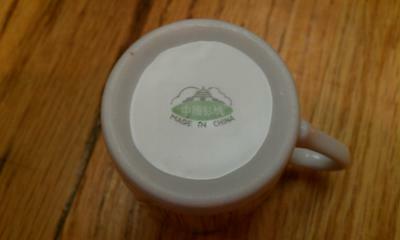 The mark is of a Chinese home in the clouds above an oval of letters above "Made In China." The colors are black, top and bottom, and green and white on the oval. This mark is on all pieces. Best just to let you see what I am talking about. This set is very nice looking vintage pattern. Very funky again to our modern eyes. Nice mark. We have had some other posts with similar (but not quite the same) pagoda marks saying 'made in China'. I don't think anyone knows the exact factory - but does it really matter with these vintage China wares? 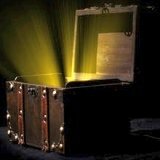 You can use the search box on the top right of the page to find the other pagoda mar entries. Comments for Mark - Oriental house in the clouds, in black, above green oval with white Chinese letters (? ), above the words "Made In China," in black. I think I have found the coffee/tea pot for this set, I was looking for the mark and came across this post! 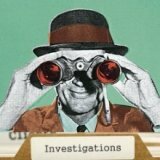 Did you find anymore info?